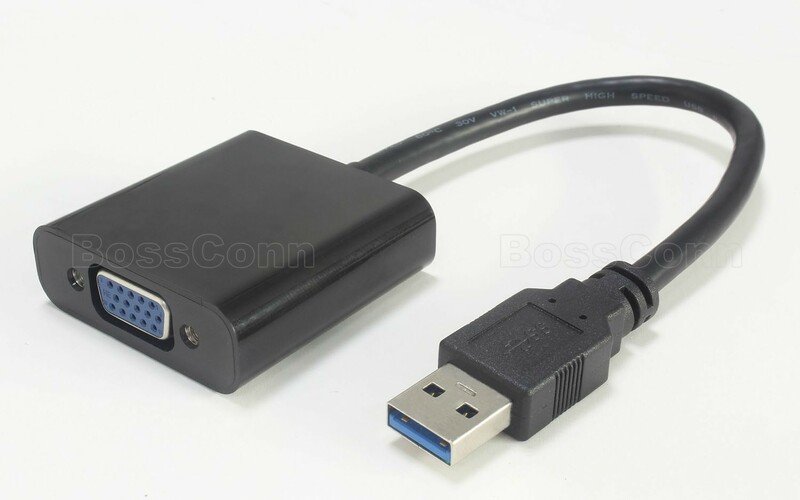 USB 3.0 to VGA Video Graphic Card Display External Cable Adapter. - The USB3.0-VGA Display Adapter enables you to connect additional display devices(CRT/LCD monitor, projector) to your desktop or notebook PC. - The connected monitor can be configured to either clone your primary screen, or extend the Windows desktop allowing visibility of more applications at the same time. - The USB 3.0 Graphic Adapter driver used to control the extra screen uses very little computer resource and offers a vast array of screen resolutions and color depths. - This ensures that there is little difference in performance between a directly connected screen and a screen connected through the USB 3.0 graphic adapter. Notice: Only Resolution 800*600 max. at USB 2.0 Port. - USB 3.0 multi-display super speed. - Resolution up to: UXGA: 1600X1200 / WSXGA+:1680X1050, 1920X1080.